First may I wish you all a belated Happy and Prosperous New Year? Most of you are probably aware that we managed to sell our Mystro lathe, for what we believe was a realistic and fair price. We have now started using our new lathe purchased from Axminster. In my view it is an excellent lathe and should suffice for all our needs. The effort in setting up and storing our 3 lathes has consequently improved, and will be beneficial, especially for our future ‘Hands On’ evenings. details of these are mentioned in an article later in this newsletter. For our two competitions held in November, we had 9 entrants submit a total of 13 exhibits for the Keith Rowley Rose Bowl – and for the Chambers Cup 8 entrants submitted a total of 11 items. 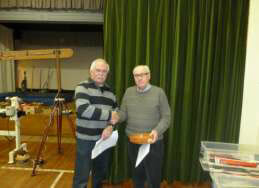 The Chambers Cup Competition was a close finish for the 3 winners, with two further entries only 1 point behind. I believe this is a first for such close marks. At our committee meetings we have considered whether the individual scores are an important issue to you. I would appreciate any comments from you regarding this and also to whether feedback is an issue. We currently have a strong membership of 69, and when this figure is compared with the competition entrants, three quarters of our membership did not enter. Why do you believe this is? The Christmas Social was a great success with minimal costs to our funds, much as a result of the efforts made by Pat and John Noakes, Rachel and Pam in the catering area. Thanks to all those of you who contributed to the event. 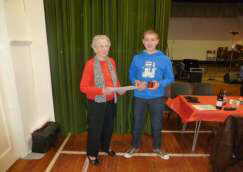 I am pleased that Jordan Richards was awarded the Chairman’s Selection for Achievement for 2012. Well done Jordan. The extreme snowfall clearly affected the attendance for Margaret Garrard’s demonstration on Saturday 26th. (More of her demo later).Despite the confidence from Margaret, I had my doubts she would make the journey, but she arrived well in time to see a number of us busy clearing the snow in the car park. Finally, Trevor has produced an excellent programme of events for this coming year; the list is published in this edition. We welcome a return to Alan whose skill and attention to detail is always inspiring. 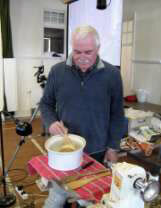 Alan frequently sells preprepared timber, following his demos, to assist us in utilising his ideas. 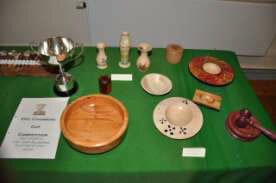 AGM evening – plus a woodturning DVD will be shown – also a Bring & Buy to off-load your unwanted accessories, etc. Hands On hosted by Vic Ramsdale. The first meeting of the New Year was coordinated by several members. Each member devoted a period to talk or demonstrate a relevant topic of their choice. The evening was a great success, and it clearly emphasised the talent and skill we have amongst our membership. Thanks to all who participated. Rachel’s has a strong interest in pyrography and this was clearly demonstrated from the various items she brought along that evening. The evening was well attended and all were able to ‘have a go’ and practice the techniques and methods to achieve success. Margaret arrived on a very snowy Saturday morning and proceeded to give us a fabulous demonstration. So much useful information on techniques and design ideas was packed into just a single day! All through the day were fascinating snippets of information into Margaret’s turning experiences. Margaret opened with a simple vase. A hole was drilled down the centre of the blank with about a 10mm drill bit. This size is optional the actual finished size. She explained about using thirds system to give a pleasing design. E.g. length (L) of the timber is 3 times the width (W). The neck is 2/3L from the base and the bulb centre from the base = 1/3 of neck to base length. The neck diameter = 1/3W. Once turned to round with a spigot on the end for the chuck, remount in the chuck. 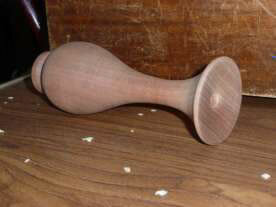 Turn the very top of the vase first, without the tail stock. Then protect the hole from the tailstock with a bit of tissue paper before replacing it for support. 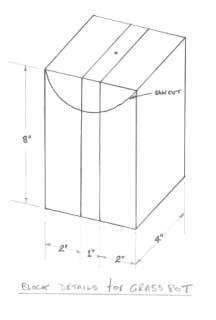 Divide the overall length into thirds as per the drawing above. The aim is to get smooth flowing serpentine curves from top to bottom. 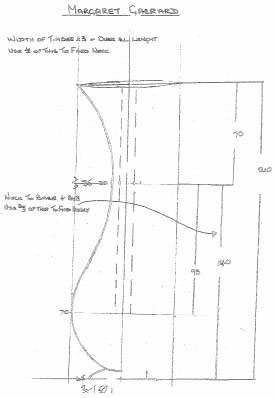 Margaret emphasised how it was useful to be able to turn left handed as well as right so that you did not obscure your own view of the work as you tried to make the smooth curve. When turning the narrow part don’t forget how big the hole is down the centre. A handy tip from Margaret – transfer the division marks from work onto the toolrest with masking tape so that you don’t lose sight of where these points are to be. Another top tip from Margaret was that a larger gouge offers more stability. The foot should be about two thirds of the width. Cut in where the bottom of the foot will be and shape the foot being sure to be crisp where the vase meets the foot. Do not part off completely. 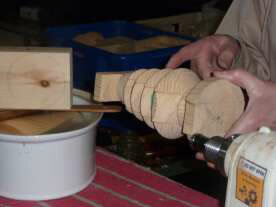 To finish the base, turn a jam chuck from a scrap piece of wood then reverse turn the base, with tailstock for support. Shape concave, so that it stands firmly. Do not part right through. Saw the last bit then remove the left over nub using power sanding. Margaret’s next piece was a grasspot which happened to have a lot of turning in common with a Christmas Tree decoration. These are both basically turned ovals. 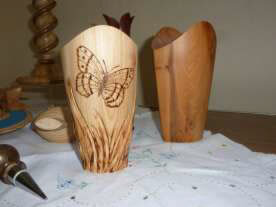 These were done in softwood. 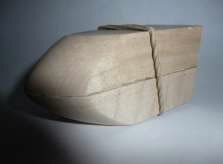 The blank for the grass pots start out as three pieces two lots of 2 x 4 inch and one of 1 x 4 inch about 8 inches long. The pieces are glued together with animal glue. Using animal glue enables the joints to be split, after shaping, simply by socking in hot water, or by zapping for 20 secs or so in a microwave oven on a high setting. With the blank glued up and centres marked, the top of the vase had a curve cut in it so that the finished vase would have a dip in the centre and wings at the edges. The cut out piece was loosely fitted back in the top and the whole thing mounted between centres to turn to round. Start to make the shape. 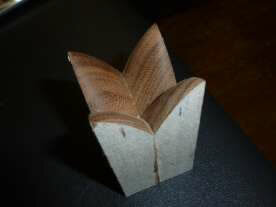 Be careful in cutting and sanding where the curved cut piece is at the top (drive end). Remove from the lathe and place in a large casserole. Pour on boiling water. As wood floats it is necessary to hold the wood down in the hot water, Robin did a sterling job with a large wooden fork whilst Margaret continued with her design ideas. Once the parts separated remove as much of the animal glue as possible whilst still in the bowl. The 2 outer pieces only, are then glued up whilst still wet using polyurethane glue, e.g. Gorilla glue, as this type of glue will fill any minor defects and benefits from the wood being wet. Hold firmly together with elastic bands. (To hold the thinner Christmas trees together electric tape can be used). down the centre to fit your glass insert. Again, reverse turn the base using a long piece of scrap wood in the chuck. This time the base must be cut flat otherwise it will wobble. 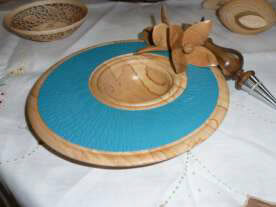 Margaret’s display bowls had wooden flowers inserted. Margaret suggested if the wood was interesting leave it in its natural state, but if the wood was less interesting then add some colour. A suitable faceplate, (or faceplate ring), is attached to the back of the bowl. Emphasis was placed on the need to think about where those screw holes, and depth of screws would be in terms of the finished bowl being off centre. After truing up the face, the face was then textured and painted using acrylic paint and allowed to dry. (The face was textured with an arbotech device fitted to an angle grinder). Mark out for a bead around the very edge. Working in from the back decide how thick the rim is to be and remove the wood. If you have a large faceplate remember to leave enough room for it to move across. Remove the paint from the rim / bead section. Form the bead. Study the front and work out which bit you want to keep and which bit will be the bowl. Move the faceplate over by 15mm and remount. Measure and note the chuck jaws diameter in expansion mode. This will be the size of your bowl rim. Transfer the measurements onto the bowl, cut in with a parting tool. Mark up for a bead around the bowl. Remove the paint from the bead area, make a bead just outside the bowl area. Deepen the bowl and slightly undercut the bead where the chuck will grip. Turn the bowl around onto the chuck jaws. Bring up the tailstock for support. Start taking off the material to form the back of the bowl. Form a bead where the bowl meets the rim, this adds strength to the bowl. When it comes to sanding the outer rim, do it off the lathe. Hand sand on the flat. 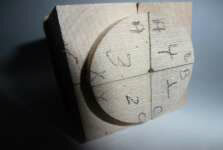 The flower is made up of four planed pieces of wood. Glue the four together with paper joints being careful to align the grains. Use thin bits of scrap wood to help hold together in clamping. Square up the ends. Mount between centres to cut a spigot on the end – using ‘Stebcentres’ at drive end and tail stock eliminates pressure on the glue joints. A cheaper alternative if you don’t have ‘Stebcentres’ is to fit a small square piece of wood at each end, (each with a small hole in the centre). Align the centre with the centre of the block and nail in place, and then turn between centres to form a spigot at one end. Mount in the chuck. Turn the inside flower shape on the end of the block leaving the end in the chuck as a square block. You end up with a sort of bullet like shape/ giant pencil shape. Remove the block. Label the bottoms with a number for each block and then either side us letters, ‘a’ together, ‘b’ together. Break the block apart on the paper joints. Rotate each piece so the insides are on the outsides. Glue together with permanent glue. Mount between centres protecting the middle from the tailstock point, e.g. a small piece of leather. Carefully turn to your petal design. Hand sand the petal edges. Turn a finial to fit the centre of the flower. The involuted flower would be finished with a thin stalk and then threaded through the rim of the bowl. The idea is that the weight of the flower would balance the off centre bowl in an upright position as the bowl has no foot, only a curved bottom. There is a lot a talk about the safe working height of the lathe – the lathe stand as long as your legs, centre working height level with your elbow, or same height as your navel, etc. I can go on and on. The only safe working height is the HEIGHT YOU FEEL MOST COMFORTABLE. Before mounting the work piece the lathe, check for any loose bark and remove it. If there are cracks or splits, reconsider whether to use that piece or remove them and modify the design idea. 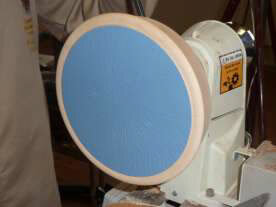 Ensure the item is mounted securely on the lathe. Double check the clamping of the chuck and of the tailstock. Set the tool rest close to the wood and spin the workpiece by hand to ensure there is no catches. Before switching on ensure minimum speed is selected – especially if the work piece is out of balance. Never increase the speed above one you feel comfortable with. Adjust the tool rest ONLY when the lathe is stationary. Always keep your hands and fingers behind the tool rest. If you have a break period, always recheck the tightness of the workpiece before restarting – especially important if the piece is ‘wet’. Keep adjusting the toolrest to minimise the gap between workpiece. 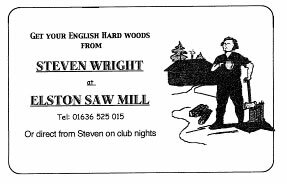 Before and during sanding reduce the lathe speed to minimise overheating – especially important for woods such as yew that will form cracks and shakes in the grain, if subjected to heat from abrading. Qualifying orders must be £100 or more, and orders are only despatched when complete. HOWEVER, please note that Axminster will only accept orders and payment from one person, who also has to accept delivery. Our secretary, Trevor Lewis, has cautiously agreed to take on this demanding role and is willing to make and pay for your orders (members could get together with others to boost the order to over £100, if necessary), and to take delivery of goods as best he can. However, he will need to be paid promptly and reliably so he is not out of pocket when his VISA invoice is due! We shall see how this works out. Trevor reserves the right to withdraw the facility if it proves too onerous! Please provide him with the product number from the Axminster catalogue when ordering. As mentioned in the last Turning Times, we have over the yearsrecognised that certain items are far more popular as tombola prizes at our charity funding events. We therefore have put together a series of A4 project leaflets in a folder for the benefit of members, such as a design of:- mushrooms, animals (hippos, mice, owls, etc. ), cup & ball, earring and ring stands, fruit, as so on…. These designs could be utilised at any of our ‘Hands On’ evenings, but also you as a member, could add or modify any of these and produce items for our Charity Table This folder will be made freely available at each of our meetings. Please consider adding drawings of items, modifications etc. as necessary. Each entrant to our competitors, (except the three winners), are entitled to a voucher that may be exchanged for goods from either Gerry or Steve on our meeting evenings. Please note that the current vouchers expire at the end of February. This is to ensure that our Treasurer may draw up accurate accounts for the AGM in March. 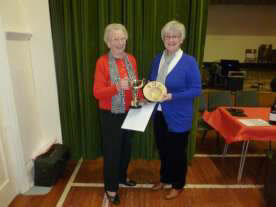 The winner was Rachel Evans with her decorated off centre bowl in sycamore and jet. Keith Morton for his bowl in yew, and to Roy Harrison for his large segmented amphora and stand. 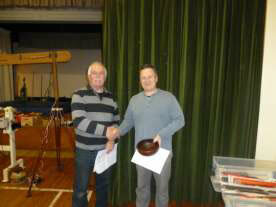 The winner was Robin with his Woodland Bowl in sycamore. 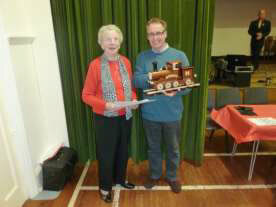 Second was Dennis Robinson with his two time-saver trains. 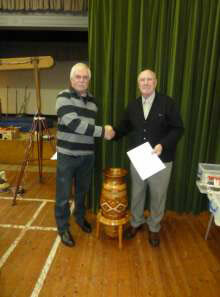 Third was Doug Barratt for his bowl in mallee burr. 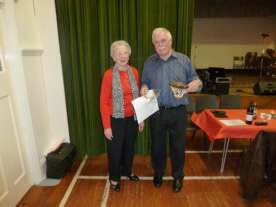 The Chairman’s Selection for Achievement for 2012. Keith Rowley Rose Bowl entries. 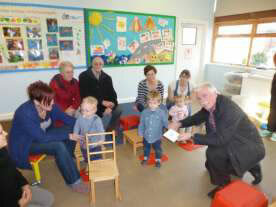 On Wednesday morning, Pat, John and Robin presented a cheque for £1,000.00 to the ‘School for Parents’. Whilst at the school they were given the opportunity to sit in with the children and their parents during two group support sessions. The school is a small local charity that gives support to parents who have children with cerebral palsy and others with Down’s syndrome. This support is in the form of specialist communication projects with the children to help them develop the basic skills of standing, sitting, looking, eating, playing, listening and touching. Up to 40 children are given this support from Lincolnshire to North Nottinghamshire into Leicestershire. Thanks you all for providing the charity items throughout the year to enable us to support this worthy charity.